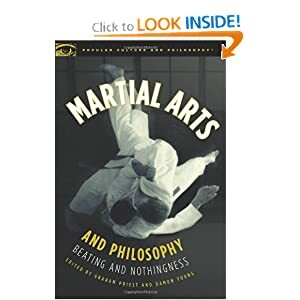 Martial Arts and Philosophy: Beating and Nothingness is a collection of essays edited by Australian martial arts Graham Priest and Damon A. Young. From the cover it totally looks like all those other martial arts books lining the shelves…you know the ones you pick up and flip through and toss back where you found them knowing that they were written by some tool who thinks he knows better and has discovered some great mystery. This title however, turned out to be nothing like that. What makes this book refreshing and enjoyable is it’s unique approach. The editors and in fact all of the contributors to the work are philosophers, most of them professors of philosophy at major universities. Also, they are most trained in Western Philosophical schools of thought. They therefore contextualize their martial art experience as well as what they have learned of the mental, spiritual, and philosophical side of martial arts through physical practice and the written works of great martial artists and Buddhist and Taoist thinkers, within the context of Western philosophy; Plato, Socrates, Stoicism, Existentialism, Feminism, etc. (Etc. is a cop-out here…I’ve only read up through the chapter on feminism!). Most of these Western philosophies are somewhat ingrained within us, at least conceptually if not by name, as 21st Century human beings and therefore, these writers take some of the most complex martial arts related concepts (what is mastery, who is a virtuous person, how do we treat others on and off the mat, what responsibility do we assume for our students and classmates as well as those we may fight against) and makes them far more approachable, understandable, as well as really interesting from a comparative standpoint. “Perhaps the greatest value of the martial arts is that they provide a response to the absurdity of human existence [that our actions, in light of the cosmos, ultimately are meaningless, except of the meaning we create for them]. If I and the other students of martial arts did live in violent environments in which we could expect to be attacked by, or have to attack other human beings, then the use of tasers, pepper spray, and handguns might be more a part of our training. Instead, in the dojo in which I train, the focus is on traditional empty hand skills. We follow a traditional hierarchy and wear traditional uniforms. Much of what we do is not obviously connected to contemporary life and cultre. The fact that we spend years trying to improve and perfect a particular series of movements in a kata is really difficult to explain. But, it is in its disconnectedness to anything but self-devvelopment that we find the true value of martial arts study. While I’m not overly concerned about being attacked, I am concerned about living a fulfilling life. I appreciate knowing that if I am in a self-defense situation, need to guard a nightclub door, or find myself in a brutal island tournament, I have the requisite skills. But this is not why I have spent years studying Karate. In the face of a world without meaning, I want to consciously and authentically make choices that cultivate, develop and refine my existence. I study Karate because it provides a structure for this, and offers skills to aid this pursuit. Martial arts in their highest form are concerned with self developement for its own sake. Anyone who sees the human condition from an existentialist perspective, and commits himself or herself to pursuing perfection through the martial arts, does so in heroic defiance of the absurdity of life” (“Sparring with Emptiness” Kevin Krein).